Northern Botswana was the location of my Botswana trip that I was most looking forward to, as it is well documented that the area offers good opportunities of sighting the endangered African Wild Dog, or Painted Dog, as it is otherwise referred to. Up until this point I had travelled through Moremi, Khwai and Central Kalahari with only a sighting of fresh dog droppings here and a call from the distance there but no sighting of the elusive dogs. I was pinning all my hopes on this final destination of my Botswana trip to finally come across these amazing pack animals. 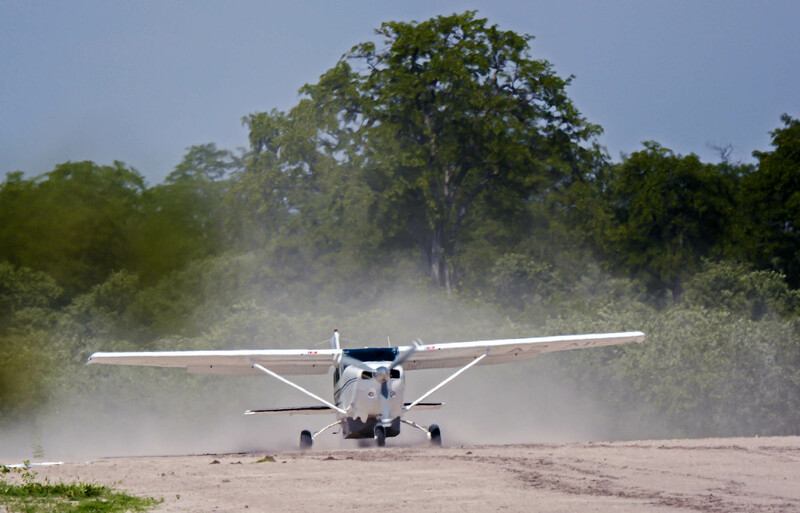 I departed from Maun early via a 6-seater Cessna aircraft to my destination in Northern Botswana. The flight was very scenic as we travelled over the Okavango Delta spotting herds of Elephants and towers of Giraffe high from above. After about 30 minutes we started to make our descent onto our airstrip. As we were landing a family of warthogs hurtled across the runway at speed, greeting up with tails erect, missing our Cessna by sheer meters. Sitting in the front seat with the pilot I was thrilled with the encounter. I looked to the pilot to share in my excitement but I witnessed a wild expression on the pilot as he stared straight ahead. 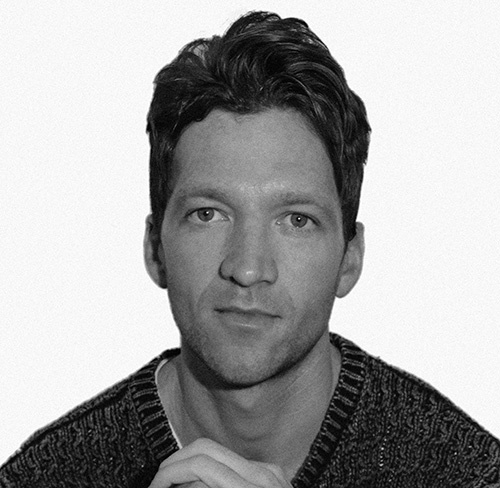 His eyes looked like they had been injected with industrial strength caffeine, his arms fully extended as if elbows didn’t exist and he had a vice grip on the steering wheel that made him look as though he had been frozen to stone by a medusa. We came to a halt, a moment or two of silence past when he said in his German accent, “That was very close…. If we had hit, very bad…… very bad. Enjoy your stay”. After “safely” touching down and sorting out my accommodation it was time to get to business and venture off on an evening game drive with the intent of tracking down a pride of lions that had been spotted in the area earlier that day. Wild dogs were however the priority and if we were to come across any tracks then we would look to find them. The vehicle has a custom made seat that sits at the very front, just above the front left driving light. This is where our tracker, Sebastian, sits and masterfully tracks game while Carlos drives the vehicle and provides all the information on the area and its inhabitants. 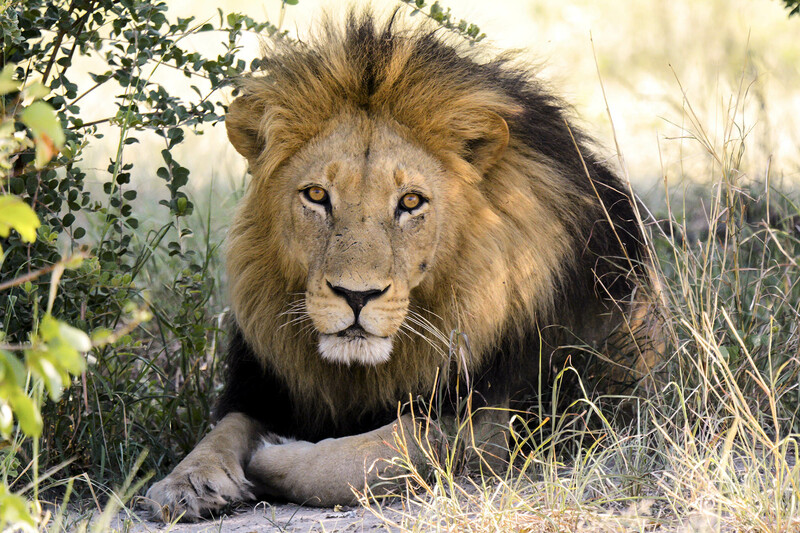 Sebastian picked up the lion tracks and after about an hour we came upon our pride resting under the shade of a tree. 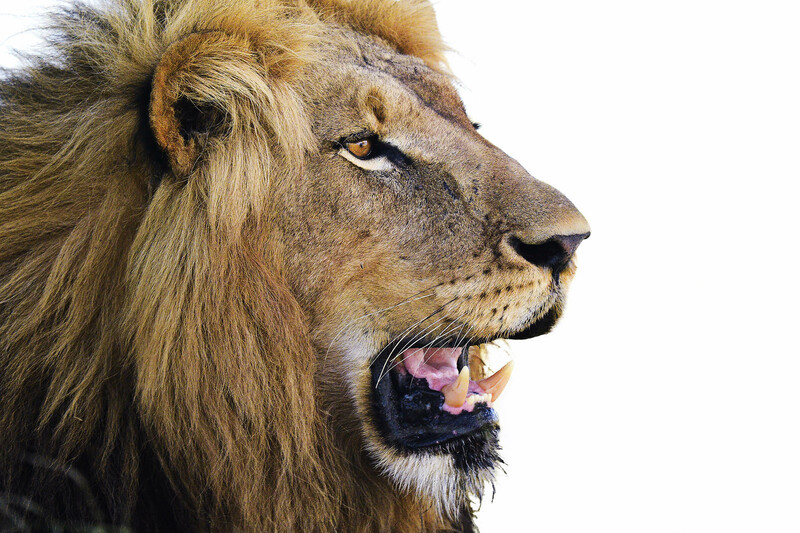 The pride was made up of two male lions, two female lions and two cubs. 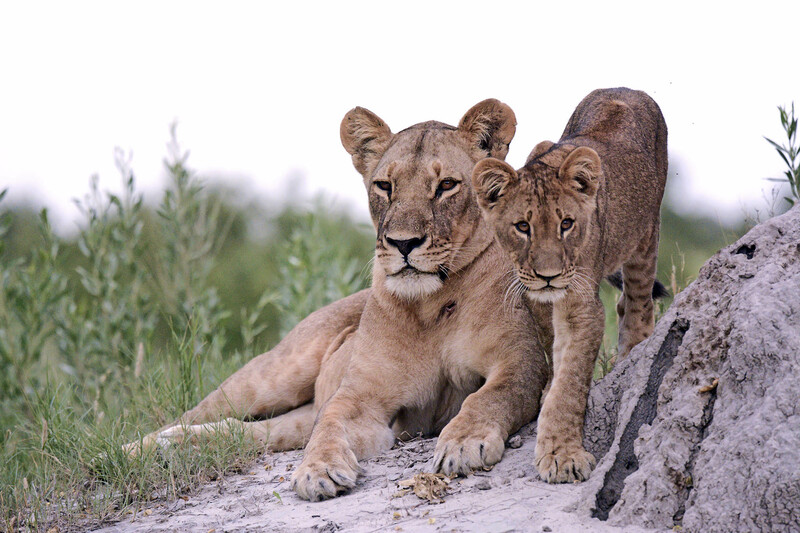 One female and her cub however were not with the pride at this time. Before we could get settled and observe the lions we drove a distance away to a nearby bush to allow Sebastian to jump out of his custom seat and climb into the safety of the vehicle. After watching the lions for a while, snapping shots of the odd yawn, they sat up and made a move. As they slowly ambled towards a water hole to refresh, we noticed where our missing female and cub had been hiding as they now joined the moving pride. They had been relaxing by a bush, the exact bush,where Sebastian stepped out of his seat to walk around the vehicle to climb into the back seat. This only occurred to me when figuring out the reason behind Sebastian and Carlos’s sudden laughter. I awoke at 5:15am for an early breakfast and a 6:00am game drive departure. 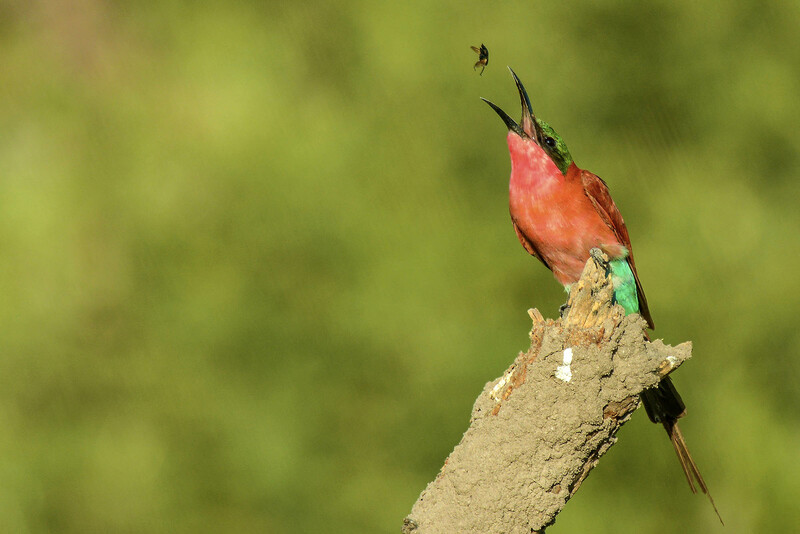 We made our way to an area in the north were Carlos had spotted wild dogs a week earlier, on the way we saw an extraordinary amount of bird life, in particular a carmine bee eater catching an early breakfast. Unfortunately Sebastian was unable to locate any prints and so the dogs had yet again eluded me. We did however come across some fresh prints of two large male lions known to the area, “The Champ” and “Beast”. 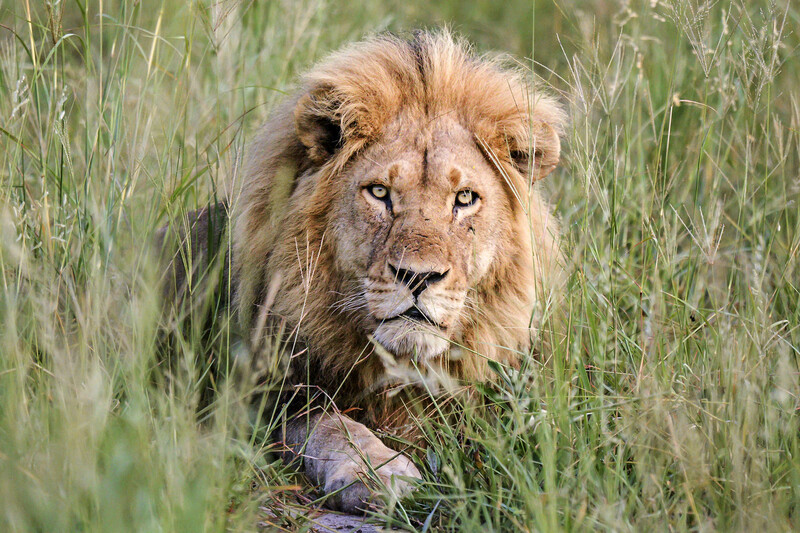 The Champ ventured over only months ago from Namibia and was immediately set upon by two males that were intent on maintaining their territory. The Champ quite liked their territory and against all odds went about giving both males a thrashing. The winner was unanimous and so entered “The Champ”. “Beast” was aptly named for no other reason than due to his beastly appearance. Ever since The Champs arrival, both he and The Champ have been inseparable. So we went about trying to locate the famous duo and to my astonishment Sebastian decided to track the two large predators on foot, armed not with a rifle but with a spindly, possibly broken stick, roughly 10mm in diameter, to“intimidate” the pair should they become aggressive. This is not typical, for everywhere else I have traveled in Africa the guides were always armed when traveling by foot, with a rifle the size of a large kitchen broom. 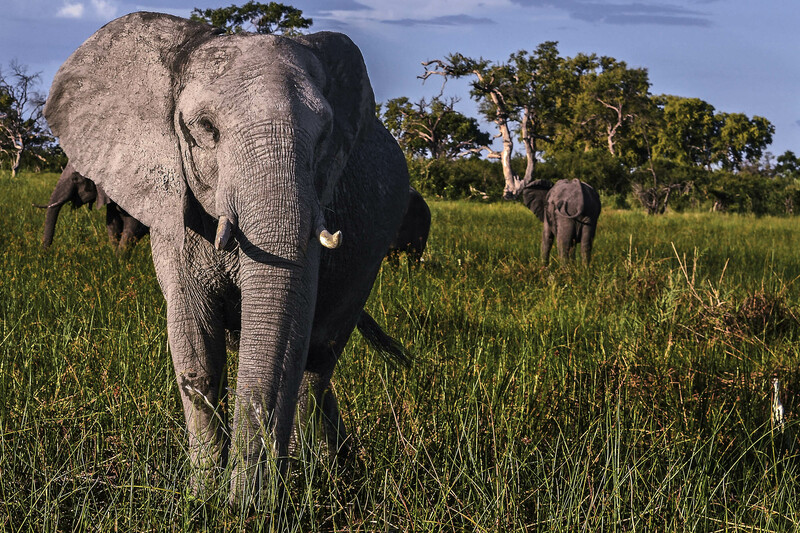 After about 45 minutes of Sebastian venturing around in waist high grasses, tracking the large mammals, he casually ventured back to the vehicle and jumped in the back seat, pointed and said “There they are”, they were just 15m away. The afternoons’ attempt to locate the elusive pack of wild dogs had us venturing to the southern most tip of the game reserve but again the dogs were keeping a low profile. Instead we spent the afternoon with a large herd of forty or more elephants. Not a bad consolation prize. It was nearing sunset and Carlos gave the word that it was time to find a location for our Sundowner drinks. 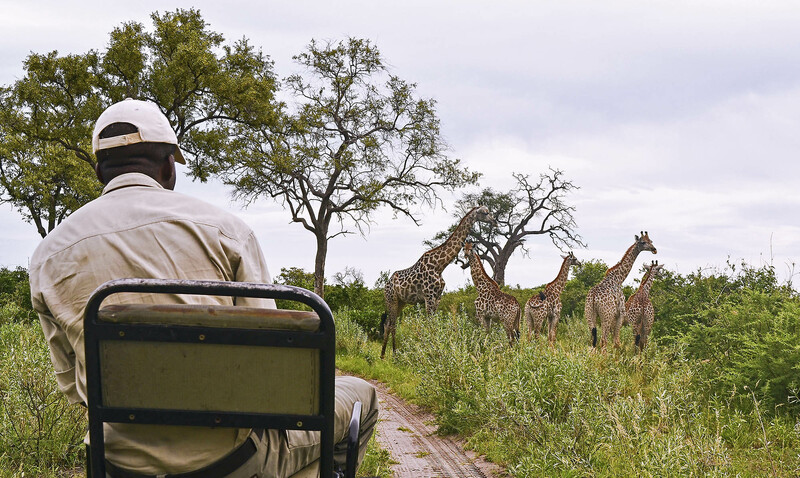 Each evening game drive you stop by a location to have sundowner drinks while waiting for the sun to set. Once the sun has set you then make your way back to camp in the night to see what nocturnal animals are about. Carlos stopped by a picturesque watering hole where we settled in for a couple gin and tonics. There was an amazing lighting storm off in the distance that had our full-undivided attention and before we knew it we were standing in complete darkness watching the event unfold. Usually we made it back to the vehicle during the evenings last remaining light but given the occasion we stayed longer than usual. We made our way back to the vehicle along the waterhole perimeter, finding it hard to see in the dark. After finally reaching the vehicle, Carlos started up the engine and flicked on the headlights. Bang! 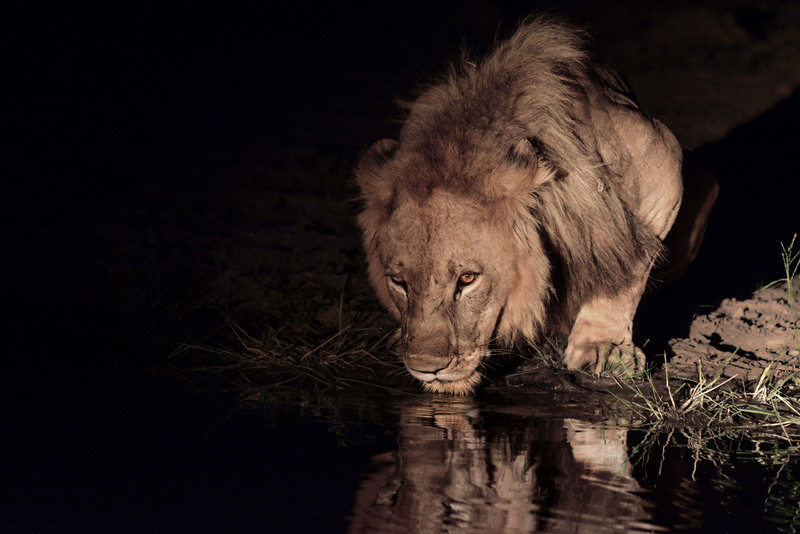 There in front of us, alerted by our headlights, stood two large male lions, about 6 years of age. We all sat in a stunned silence as the lions then strolled over to where we just stood moments before and calmly began to drink from the watering hole, regarding our presence from time to time with intensity in their eyes. These lions were on guard as they were patrolling their area, making sure that there were no immediate threats to the pride. Had we walked the opposite way around the watering hole, we would have walked straight into these two – the outcome being anyones guess. A truly wild encounter. After all the excitement and retelling of the lion encounter it was time to hit the hay and look forward to the adventure of the next day ahead. 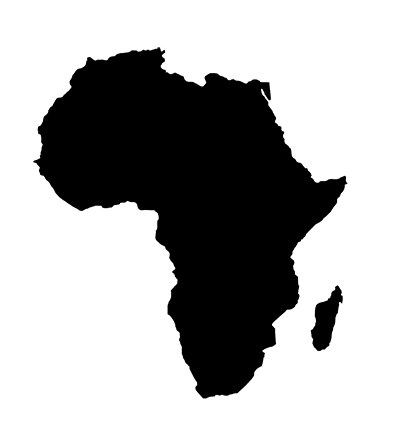 That night was extremely hot, the power to my room was constantly short-circuiting. This wasn’t uncommon given the African heat and I was shown what to do in the event of a short circuit. I was to go outside and flick the switch in the fuse box that is positioned around the corner from my sliding door. As my fan wasn’t working I woke up around 3:30am thinking I must have drank 5 liters of water and subsequently urinated 5 liters of water over myself in my sleep. Thankfully this wasn’t the case, I was just in a heavy sweat. Now I’ll admit that if there was one rule I was constantly made aware of it was that you do not venture outside of you room during the night for any reason. In my sweaty haze however I failed to regard this rule. I ventured outside, eyelids barely drawn trying to adjust to the night and made my way to the fuse box. I staggered around the corner only to have almost walked into the back of a big bull elephant grazing on the grass next to my fuse box. I stood there for a while squinting heavily trying to make sense of my situation. After what seemed a ridiculously long period of time the realization finally hit and so too did the panic. I would like to say I slowly retraced my steps back inside in a calculating fashion but the reality was my retreat was anything but. The fan remained off for the remainder of the night and I got very little sleep.The following day I could barely structure a coherent sentence let alone speak one. The previous night of little sleep and near death caught up with me, both physical and mental collapse seemed very real but somehow I fought on in the desperate hope of finding the wild dogs. We spent all morning and again all evening searching relentlessly for any sign but again nothing availed and it was about at this time that I was beginning to think that the species had in fact become extinct. 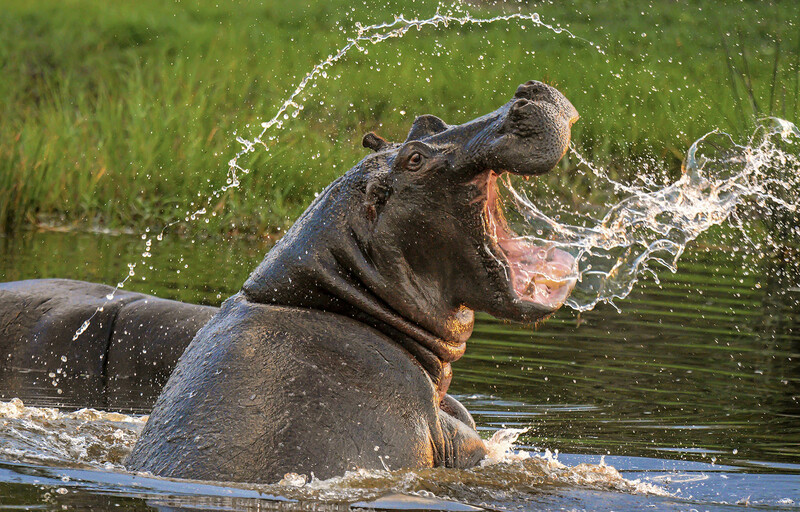 The day didn’t offer anything to exciting aside from being charged by an aggressive hippo for obviously intruding on its domain. I was starting to think not only that the wild dog was now extinct but that I was also overstaying my welcome based on the animal behavior I was experiencing. The next day I was greeted with some outstanding news. Carlos had heard a report that a pack of wild dogs were making their way across from the south, without time to eat lunch or offer a question we were in the vehicle in a snap to hopefully locate the pack. As it happens everything was determined to hold us up in getting to the possible location. We saw a great owl fly to a nearby tree which was odd given the day light and as soon as it landed it started to get harassed by a drongo. The great owl preys on other bird species, when they are spotted, they are generally set upon by birds that have young in the area. 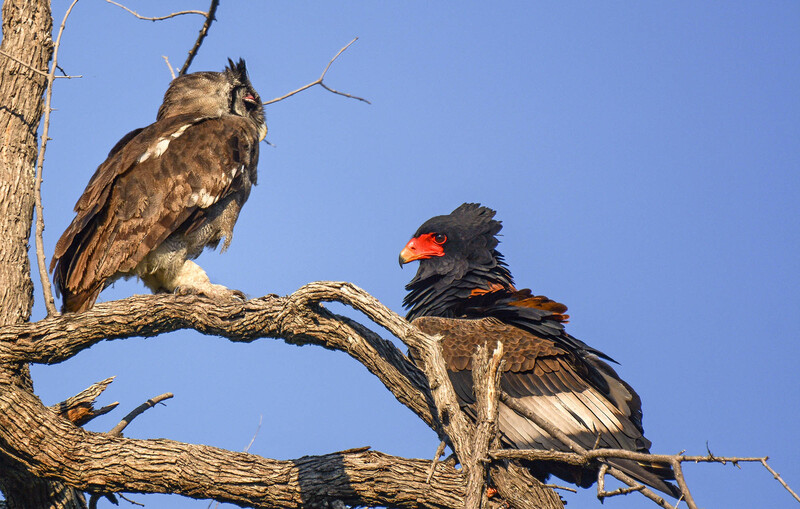 We stopped to watch this rare display when suddenly a Battlier eagle attacked the great owl in a blur from nowhere… claws, wings and feathers flourishing about, it was an amazing piece of nature to witness. When we finally set off again we of course received a puncture; getting to the dogs’ location on time wasn’t looking likely. We continued to search and search, losing more and more light and finding no wild dog tracks, hope was all but diminished when suddenly there it was! A single wild dog hunting in the area, I was that excited to see one that I hadn’t even raised my camera but just watched. We followed the dog as it went from prey to prey, first antelope then zebra, both of which were too big for a single dog to take down. 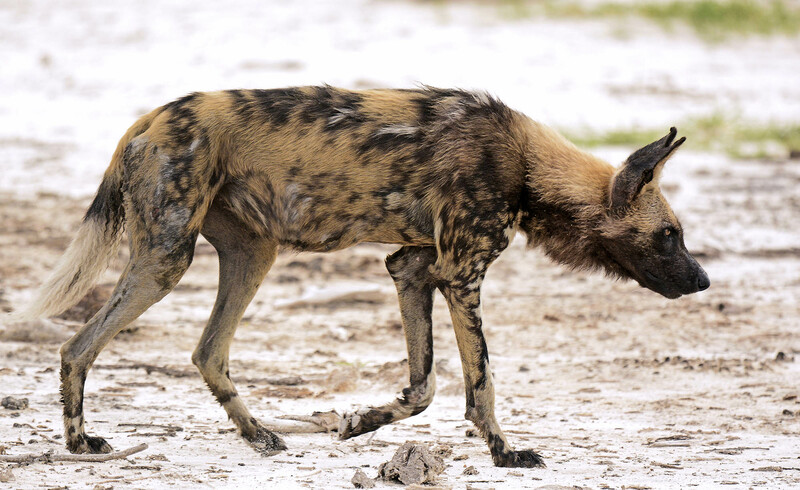 When wild dogs hunt they simply lope around until they come across anything edible, when they do they use their amazing endurance to wear the pray down. They will pursue the pray over great distances. Sebastian said they once followed a pack on a hunt for more then 30 kilometers. We followed this dog hunting, driving through thick bush, until it came to an abrupt stop and sent out a call to the pack. Before we knew it another dog appeared, then another… and another. Before we knew it there were 14 wild dogs playing together. It was incredible to finally witness, after 3 weeks of searching, these wild dogs in their habitat. The next day I was due to leave, but after finally coming across this pack of wild dogs I decided to stay an extra night in the hope that I might be able to spend some more time with them. We again picked up their trail but unfortunately the pack must have been hunting in the dense bush, which we were unable to navigate through. The day however provided plenty. In the afternoon we came across a female lion with her two cubs. The female caught wind of a wilder beast and began stalking its prey. With camera poised I was ready for action. The lion had very little cover as the wilder beast was out in the open but still managed to creep to a distance of 20 meters before the wilder beast realised what was happening and sprinted off. We stayed with the female and her cubs for a moment longer watching the cubs cause all manner of trouble for mum before we set off for our sundowner drinks location. The 5am alarm startled me awake once again. This was my last morning before my departure back to Maun and my last chance to catch another glimpse of the wild dog pack. We ate a quick breakfast and were quick to jump in the vehicle as reports had come in of their location in the south. Sebastian had picked up their trail and we ventured some distance off road, coming across a spotted hyena along the way and stopped to determine the next direction to take. “Oh” said Sebastian, “there they are”. A wild dog was sitting directly in front of us, a grin spread from ear to ear. We sat and watched and in no time the lone dog turned into a pack of fifteen. They sat and looked rather settled but one then caught wind of something and was off on a run. The others quickly followed. It soon became obvious what they were after when we saw a skinny tail standing vertically upright moving rapidly through the grasses. A warthog. It was at this time I thought about what the warthog must be going through during its frantic flight. 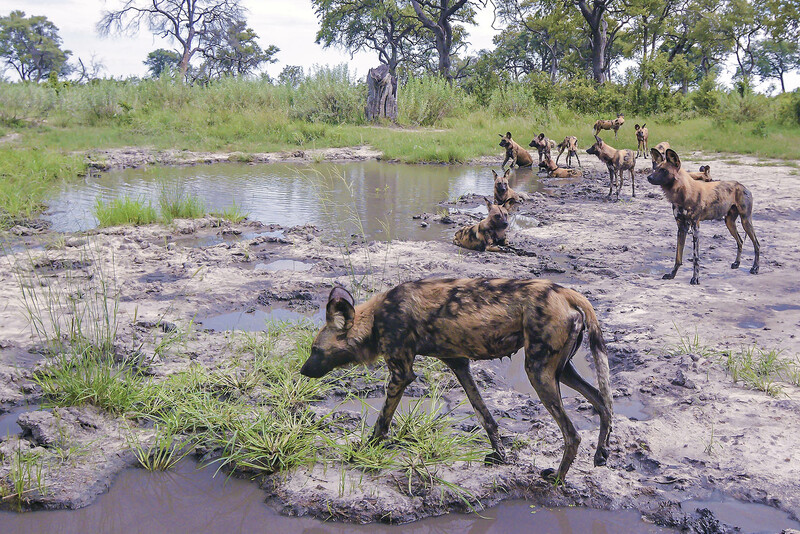 15 hungry wild dogs were hunting it down. 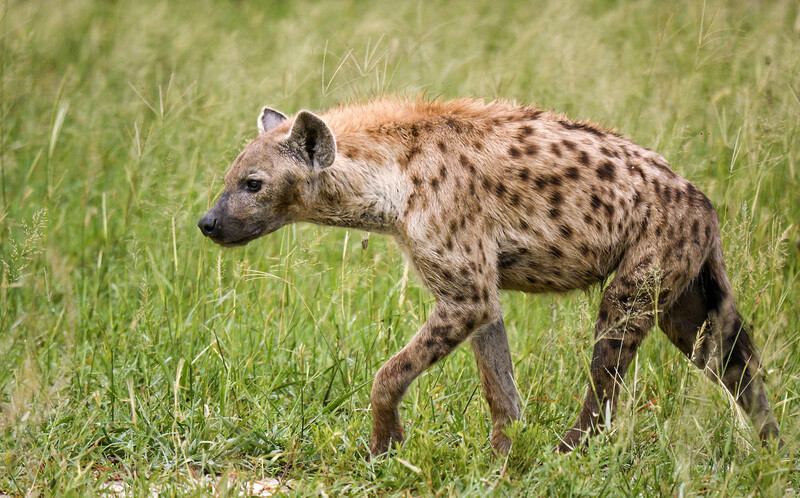 Wild dogs are Africa’s most successful hunters, with nearly 80% of hunts ending in a kill. I am not sure if the warthog was aware of these statistics but I’m sure it was aware that the odds of survival were clearly not its favour. But this warthog was to join the exclusive group of the lucky 20% as it found a burrow to dive itself into and escape. It’s a tough scenario as on one hand I was relieved that the warthog got away but on the other I was alarmed by the look of starvation some of these dogs exhibited. We sat observing the dogs a while longer before making our way back to campc ompletely content with our mornings experience. 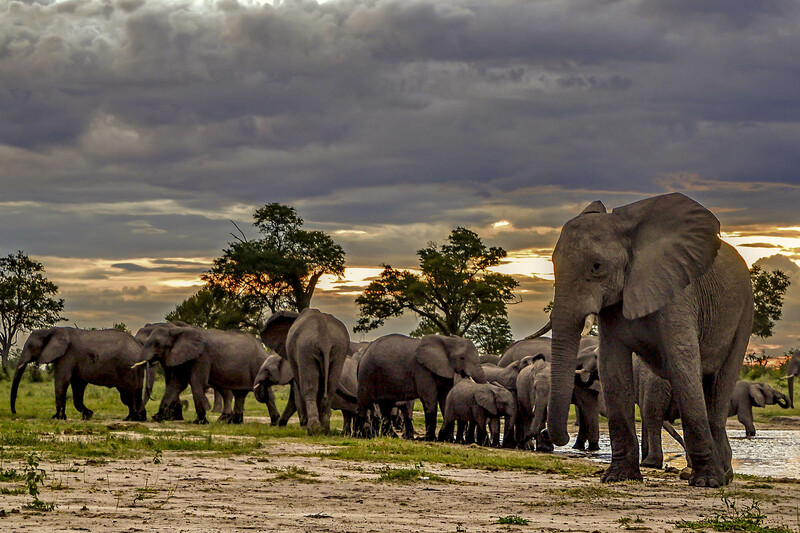 What an extraordinary experience in Northern Botswana. Unexpectedly standing within meters of two large male lions, to almost walking into the back of a large bull elephant and then to be charged by one while unceremoniously lying on my stomach. And finally, after 3 weeks of relentless searching, to finally come face to face with a pack of endangered wild dogs. Yes this trip had its share of close encounters and wild life experiences. A trip I am not likely to forget.